There is an ongoing global trend of population migration to urban centers. Worldwide, new cities are being built and existing urban areas are deeply transformed and extended. This is creating large demands on urban infrastructure and additional capacity for all the required services, including existing transit corridors, energy, water and waste management systems. In this context, the construction industry is forced to find new modern solutions, to obey short execution times and to accept constantly evolving procurement rules. The above requirements are supported by a strong and rapid evolution of technologies applied to equipment, tools, instrumentation and materials used by our industry for the installation of deep foundations/excavation and ground treatment/improvement methods. These continually modernizing technologies have an important positive impact on programming and project criteria, modelling, design and structural engineering. 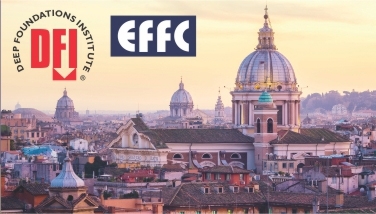 Deep Foundations Institute (DFI), a global association comprised of professionals and companies involved in the design and construction of geotechnical projects, and European Federation of Foundation Contractors (EFFC), representing the European specialist contracting community, are both committed to improving quality, safety, innovation, durability, sustainability and standards of technical competence. The conference’s intent is to explore the industry’s challenges presented by owners and owners’ representatives (consultant/construction managers) who are associated with building the infrastructure systems that meet modern demands. Additionally, the event will be the forum for presentations from contractors, engineers, researchers and manufacturers (technology providers) on projects and studies related to new technologies, methods of construction, design concepts, equipment, materials and electronic in connection with the developing of Project Management Information System (PMIS) and the Building Information Modeling (BIM) applied to the geotechnical and foundation industry. Tickets will be available from 3rd December from the DFI website.